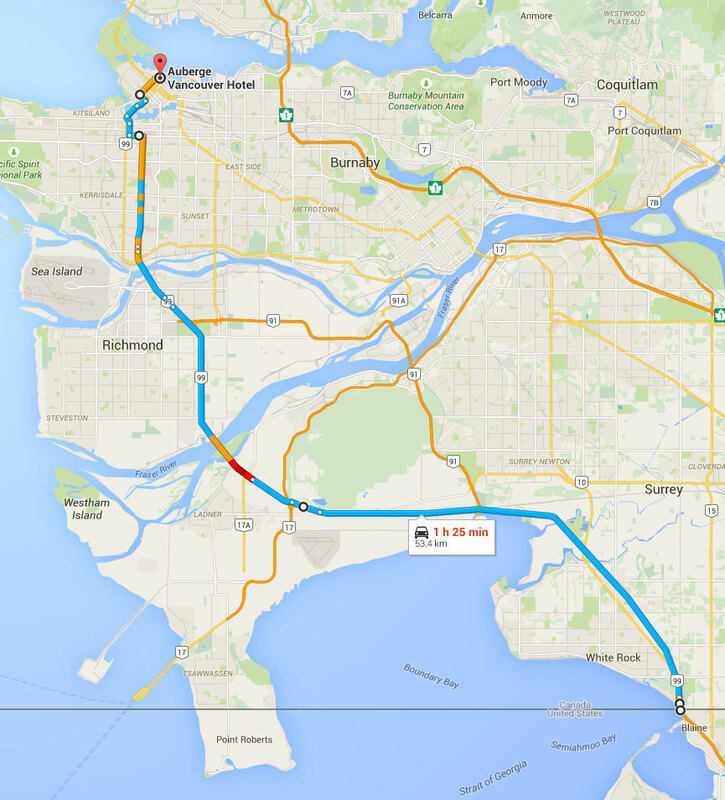 Driving North on Highway 5 you will cross the border at the Peace Arch Crossing. Highway 5 becomes Highway 99. Follow Highway 99 for approximately twenty (20) miles. You will travel through a tunnel and across the Oak Street Bridge. You are now on Oak Street. Follow Oak Street due north to West 12th Avenue. Turn left on West 12th Avenue and continue to Hemlock Street. Turn right on Hemlock Street and cross the Granville Street Bridge. Turn left on Davie Street off Granville Street (the second intersection after the bridge). Follow Davie Street to Burrard Street and turn right. Follow Burrard Street to Cordova Street and turn right onto Cordova Street. The Auberge Hotel Parkade is the second parkade on the right-hand side just past the TC Lion’s Pub at the corner of Howe Street. It is an underground lot and clearly marked “The Terminal City Club Parkade”. Please advise the parkade attendant that you are checking into the Hotel and you will be issued two parking passes, one to place on the dash of your car and the other to present to the Front Desk at check-in. There is a daily charge for parking, applied to your hotel account, which includes 24 hour in and out privileges.